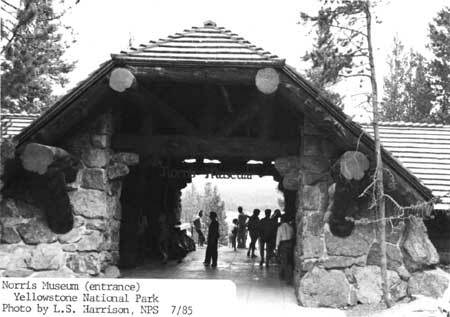 Norris Museum (entrance), Yellowstone NP, 1985. The three museums designed by Herbert Maier are located at separate areas in Yellowstone National Park. A fourth museum completing the group was at Old Faithful, but it was torn down and replaced by a new visitor center in 1971. Fishing Bridge Museum is on the north shore of Yellowstone Lake near the center of the park. The Madison museum is in the northwest quadrant. The Norris Geyser Basin museum is between the two, approximately 14 miles northeast of the Madison museum and 28 miles northwest of the Fishing Bridge museum. The three museums and the naturalist's residence and amphitheatre at Fishing Bridge were all designed by Herbert Maier, who at that time was an architect working for the American Association of Museums and the Laura Spelman Rockefeller Foundation. All of these facilities were donated to the National Park Service. The Madison museum (1929) is the smallest of the three, and was built adjacent to the junction of the Madison and Gibbon Rivers. This small, one-story structure has battered rubble masonry up to sill height, with double-coursed shingles above. The building is T-shaped in plan, with a gable roof over the main portion and an intersecting hip roof covering the wing. The roofs are covered with wood shingles. The gable ends are finished with vertical siding, with tree shapes and diamond patterns sawn into the boards. Structural log brackets, beams, and outlookers are visible at both gable ends. The main entrance to the two-room structure is through a multi-light door with bevelled glass and with pared twelve-light fixed sash windows to the left. A second door on the front elevation is of heavy wood planks with wrought-iron hardware. The rear exit door is similar to the front door. Other windows in the structure are multi-light fixed sash windows and single-pane viewing windows. A small stone chimney cuts through the roof at the rear of the structure. A wrought-iron sign stating "trailside museum" hangs above the front entrance to the building. The interior walls are wide drop-channel siding placed horizontally. The floor in the main room is flagstone. The floor in the wing is carpet, probably laid over a wood sub-floor. Posts, beams, rafters, and purlins are exposed on the interior. The posts, like those in the other museums, are peeled logs with knots and gnarls left in place. A flagstone terrace enclosed by low walls at the rear of the building overlooks the confluence of the Madison and Gibbon Rivers. A small memorial of natural stones contains two plaques--one commemorating Stephen Mather, the first director of the National Park Service, and another commemorating the Yellowstone Park idea and the Washburn/Langford/Doane expedition and campsite of September, 1870. Changes to the interior include the addition of carpet, track-lighting, and new electrical work done in 1971 for the centennial celebration. The wood stove formerly used to heat the building was removed. The partition between the two rooms was removed to make the building one larger exhibit space. The building was re-roofed and much of the exposed logwork repaired or restored during the summer of 1982. The building's original shingle roof was painted green, but the new shingle roof was left unfinished. The amphitheatre adjacent to the building retains minimal historic fabric of note. The surrounding vegetation was cut back in 1983. The Norris Museum (1929) is the most architecturally imposing of the three remaining museums. Maier's choice of a more dramatic building was appropriate, however, considering the site above the geyser basin and the building's function as the gateway through which visitors would pass to gain access to the overlooks and trails of the basin. The building is a one-story structure, generally rectangular in plan. The central portion, which contains an open-air foyer, is sheltered by a massive clipped-gable roof. The west wing contains an exhibit room and office spaces. The east has two wings--one for exhibits, and one for a small seasonal residence. The hip roofs of the wings and the main gable roof are covered with double courses of long wood shingles. Visitor access is through a covered foyer that is sheltered by the largest roof section. Exhibit rooms are to the left and right, directly off the foyer. Straight through the foyer at the rear of the building is the flagstone terrace overlooking the geyser basin. Stone steps lead down from the building's terrace toward the basin. The stone walls of the building have extreme batters which emphasize the fluid, irregular shapes of the boulders. Outlookers and brackets are exposed at the gable ends. The wall above the stone portion is wood, finished with double rows of wood shingles. Massive posts on the interior are again exposed, with their knots and growths worn smooth by the thousands of visitors who run their hands across them each summer as they pass through the building. "Norris Museum" is spelled out in wrought iron letters that hang from a beam at the entrance. Interior walls are covered with drop-channel siding. The log roof structure is exposed throughout the building, except in the residence. The exhibit rooms are closed off at night and during the off-season by sliding doors. The door to the office space at the west end of the building is made of heavy planks with massive hinges and original hardware. The easternmost wing has a small exterior stairwell that leads down into the two-room residence. Partitions and ceiling in the residence are beaverboard painted white. Little has been done to update the residence, and even the bathroom fixtures are original. Alterations to the building include the addition of modern lighting, the replacement of the original window glass with green lexan to accommodate mood lighting for exhibits, and the addition of a partition to separate out a small office space in the west wing. The original floor in the residence has been covered with linoleum. In 1982 some of the deteriorated logs were stabilized or partially restored. The Fishing Bridge Museum (1930-31) is a stone, log, and concrete structure with a central portion flanked by wings to the northwest and southeast. The massive boulders used for the lower portions of the walls vary in size but are up to five feet in diameter. The walls have an extreme batter that makes the building seem as if it is growing out of a rock outcrop. The stonework rises up to the eaves at the building s corners, and up to the window sills throughout the remainder. The upper portions of the wall are wood frame, finished with wave-patterned, double-coursed shingles on the exterior and with plaster on the interior. The central roof is a simple gable. The roofs of the smaller wings are also gables with their outside ends clipped. All of the roofs are covered with wood shingles. Windows are casement sash, varying from multi-light to large single panes with multi-light transoms above. A large stone chimney pierces the roof on the northeast portion of the building. The fireplace which it serves is no longer used and is in the area set aside as a small office space. The interior is divided into three main rooms and two anterooms for exhibits and a handful of smaller spaces for staff offices, mechanical systems, and storage. Floors are scored concrete, now covered with linoleum in the museum sections. The logs around the openings to the exhibit rooms and the southeast and northwest wings are peeled, but were left in a rustic condition with knots and gnarls and trunk irregularities sanded over. The logs have a low-gloss satin finish. The steps leading up to the rooms on the northwest are rounded concrete steps, which replaced the original stone steps that may have proved too rough in texture for visitors. The central room has exposed peeled log rafters and purlins, with exposed wrought-iron strap hinges. The central room has free-standing exhibit cases containing faunal specimens which are some of the original exhibits designed by Carl Russell. The exhibits in the flanking wings are wall-type exhibits of more recent origin. The central exhibit room has two large, wrought-iron chandeliers hanging from the ridgepole. The chandeliers are decorated with elk and deer antlers and complete skulls, and rams horns and skulls from bighorn sheep. Changes to the building included the addition of linoleum over the original scored-concrete floor, the replacement of the stone steps with concrete steps, the addition of new fluorescent lighting, the addition of new stud-wall partitions for office spaces, and the addition of new exhibits in the wings. Some of the windows in the wings were covered with plywood on the interior to accommodate new (removable) walls for the exhibits. Both the museum and naturalist's residence underwent rehabilitation during 1983. The bulk of that work included stabilizing or replacing exterior logwork in the buildings' roofs. New 24" shingles for roof replacement could not be manufactured, so 24" shaked replaced the original roofing material. The naturalist's residence (1930) is northeast of the museum, and is occupied seasonally during the summer when the museum is open. The one-story structure is U-shaped in plan. The lower portions of the building are rubble masonry to a point just above floor level. The upper walls are wood frame, covered with wavy-patterned, double-coursed shingles. The hip roof is finished with wood shingles, double-coursed every fifth row. The rafter tips of the log roof structure are exposed under the eaves. Most of the windows in the building are nine-light fixed sash or casements, with the exception of the kitchen window which has a large single pane looking out toward the lake. The central door of massive planks and original wrought-iron hardware is of particular note. Changes on the interior of the residence include updating the bathroom fixtures and the installation of sheetrock covering up the formerly exposed logwork of the roof structure. The original stone or concrete floors are now covered with linoleum. The museum is surrounded by terraces bordered by low stone walls that are just the right height for sitting. Adjacent to the museum to the northwest is the amphitheatre (dedicated 1932), also designed by Herbert Maier. The permanent stage and the supporting frame for the screen were constructed of logs. The frame around the screen was decorated with skulls and antlers similar to the chandeliers on the museum interior, but these have been removed. The original log seats were replaced with thick plank seats in the same configuration. Directly beyond the museum to the south-southwest is a stone terrace overlooking Yellowstone Lake. The terrace was designed to fit the contour of the land just before it drops down to the lakeshore. Stone steps provide access from the terrace down to the shore. Pathways connecting the parking lot, museum, amphitheatre, and lake terrace are all edged with stones to encourage visitors to stay on the trails. The entrance from the parking lot to the museum and amphitheatre area is bordered by a stone-and-log fence. This, too, guides visitors on to the paths and trails through the area and protects the delicate vegetation surrounding the site. The Fishing Bridge, Norris Geyser Basin, and Madison Museums are of national significance in architecture for two reasons. First, the buildings are the best structures of rustic design in the National Park System. Second, because of their exaggerated architectural features and organic forms, the buildings served as models for hundreds of other buildings constructed throughout the nation in state, county, and local parks under the auspices of the National Park Service during the work relief programs of the 1930s. The style of these museums influenced the style of other buildings of entirely different functions in national, state, and county parks. On a lesser level of significance, the buildings epitomized the concept of "trailside museums" where visitors received orientation to the resources of an area through the National Park Service s interpretive and educational programs. Thus they play an important role in the history of the National Park Service. Maier's architectural work for the American Association of Museums was unlike anything that had come before. His Yellowstone museums had a few elements common to bungalow structures--the battered stonework, clipped gables, and low, horizontal emphasis; but in Maier's buildings the onsite and locally-available materials were left more in their natural condition, reflecting the scale and roughness of the surrounding wilderness. The enormous logs of the Yellowstone museums were peeled but not sawn, and their rustic knots were left in place giving a tactile richness to the building form. The boulders of the heavily battered walls were left in their natural shapes. Their massive sizes and irregular shapes were emphasized, like the irregularities in nature. His buildings responded to their sites in their low shapes and appropriately fit the contours of the landscape. Maier banked all three museums into the gentle contours, and provided observation terraces that were at least half the size of the interior floor spaces. He even provided tree wells in the terraces to accommodate the larger specimens that existed on the sites prior to construction. The terraces encouraged visitors to spend more time outside enjoying the local features and, hopefully, to reflect on what they had learned and seen in the museums. The interiors of the museums stressed simple, natural materials befitting the ambience of the buildings. The scored concrete floors and plaster walls receded into an oblivious background while the colossal, gnarled-log posts and heavy log rafters and purlins commanded attention. The decorations on the simple wrought-iron and chain chandeliers of Fishing Bridge Museum were elk skulls and antlers which further reinforced the building's emphasis on nature. The outdoor amphitheaters provided logical places for visitors to gather to hear naturalist talks. Maier's buildings were perfect solutions for an architecture appropriate to the outdoors: informal, through their use of natural materials and horizontal lines, but loaded with a strength of design and heavy-handed expression that subconsciously suggested the smallness of man in relation to nature. Herbert Maier's work was noticed and his influence spread. His museums in Yosemite, Yellowstone, and Grand Canyon had all been approved for construction through the normal Park Service channels: the Western Field Office (later the Branch of Plans and Design) and the Director's office. Maier was probably recruited by Horace Albright , but other references he listed on an application included Conrad Wirth and Tom Vint. During his tenure as Regional Officer for Districts 7 and 3 (including 13 southwestern states) of the National Park Service's State Park Emergency Conservation Work programs, Maier's influence on the design of state park structures throughout his mid- and southwest became strongest. Herbert Maier kept four volumes of photographs and drawings of the museums and other buildings he designed which he endearingly called "The Library of Original Sources." He encouraged people who worked for him during his tenure as Regional Officer to carefully study the "Library." Cecil Doty, who worked for Maier during the Emergency Conservation Work program and later designed the National Park Service Region III Headquarters Building in Santa Fe (also being nominated for Landmark status), said his design for the Custer State Park, South Dakota, museum was a "cold copy off his (Maier's) Norris Basin museum." Doty said that Maier's architectural work was a strong influence on him and the other architects in the organization. To Doty and the others, Maier was the boss who frequently looked over their shoulders and told them: "You do it this way." Maier's Yellowstone museums, and a host of buildings designed by architects and landscape architects working with him during that time were featured in the 1935 Park Structures and Facilities and the longer 1938 edition entitled Park and Recreation Structures, which served as the teaching tools for architects and landscape architects hired by the National Park Service or under the work relief programs of the 1930s. These books summarized the basic design philosophy for an architecture appropriate to park lands. Maier's work, and the work of his subordinates was a major contribution to that architecture. The concept of "trailside museums" or field museums came about in the 1920s, when visitors began driving through national parks in their own vehicles rather than on escorted tours provided by park concessions outfits. The first park museums were at Yosemite and Mesa Verde. Maier saw his museums as "not mere passive repositories of 'exhibits' but active interpreters and guides to the national and cultural features and historical associations of their parks. They are laboratory manuals...for use not only by the qualified student but by anybody and everybody." Maier saw the museums aiming to "interpret," not just to provide cold facts. To him, "the great thing is to get people to go and see; intelligently, if possible; but by all means to see. And nothing conducive to that end is to be disdained." Maier's buildings were among the first to house that new concept of "interpretation"--the "revelation of a larger truth that lies behind any statement of fact" --that had developed in the National Park Service through the efforts of Stephen Mather, Horace Albright, Freeman Tilden and others. Herbert Maier understood that concept in the way he designed his museums. Maier's influence on park architecture was overwhelming. Of the early buildings constructed for the fledgling Service, his best typify the rustic design philosophy. Maier admitted being slightly uncomfortable with the concept of buildings in national parks and saw them as "necessary evils." To him "even the finest building...is somewhat of an intruder." His success was in minimizing that intrusion by maximizing the use of indigenous building materials in a way that seemed as if the building had just grown of its own accord on the site--with rock walls cropping up out of the earth but so strongly tied to it through, as he said, "the horizontal key"  that made his buildings blend with the surrounding ground. 1. Herbert Maier, Official Personnel Folder (O.P.F.). 2. Interview with John Wosky, conducted by William C. Tweed, August 24, 1976. 3. Maier O.P.F., loc. cit..
4. Interview with Cecil Doty, conducted by Laura Soullière Harrison, March 10. 1985. 5. Herbert Maier, "The Purpose of the Museum in the National Parks," Yosemite Nature Notes, May, 1926, p. 37. 7. John Ise, Our National Park Policy (Baltimore: Johns Hopkins Press), p. 201. 8. Maier, "The Purpose of the Museum in the National Parks," p. 38. Coleman, Laurence Vail. The Museum in America: A Critical Study. Washington, D.C.: American Association of Museums, 1939. Good, Albert. Park and Recreation Structures, Vols. I-II. Washington, D.C.: Government Printing Office, 1938. Good, Albert. Park Structures and Facilities. Washington, D.C.: Government Printing Office, 1935. Herbert Maier, Official Personnel Folder. Ise, John. Our National Park Policy: A Critical History Baltimore: Johns Hopkins Press for Resources for the Future, Inc., 1961. Interview with Cecil Doty, conducted by Laura Soullière Harrison, March 10, 1985. Transcript available in the Southwest Regional Office library. Interview with John Wosky, conducted by William C. Tweed, August 24, 1976. Maier, Herbert (in collaboration with N.N.). "The Purpose of the Museum in the National Parks," Yosemite Nature Notes, May, 1926. National Park Service files, including National Register nominations, Classified Structure Field Inventory Reports, and building maintenance folders. Tweed, William C., Soullière, Laura E., and Law, Henry G. National Park Service Rustic Architecture: 1916-1942. San Francisco, National Park Service, 1977. Norris Museum. The boundary is a rectangle measuring 99' x 151' whose sides run parallel to and 30' out from the bases of the outermost walls of the building. Madison Museum. The boundary is a rectangle measuring 122' x 142' 6" whose sides run parallel to and 50' out from the bases of the outermost walls of the building. Fishing Bridge Museum and Naturalist's Residence. The boundary is a square, approximately 315' on each side, beginning at a point on the south curb of the parking lot edge 210' northeast of the northeast corner of the Museum, then proceeding south-southwest 315' to the shoreline of Yellowstone Lake, then 315' west-northwest along the shore, then 315' north-northeast to a point 210' northwest of the northwest corner of the museum, then east-southeast along the curb to the starting point.